Andrew and I are committed omnivores, so it is slightly unusual that our first two guests have both been vegetarian, and vegetarian cuisine is not something that either of us has ever had to embrace in any meaningful way. Given that my daughter was one of those guests, I remonstrate with myself that I have not been more creative in the kitchen with veg in the past. That said, living in Spain has given me a new-found respect for vegetables, as the produce in these parts is so tempting, fresh and abundant. So, a stand-by dish that we have modified and that comes out whenever we have vegetarian guests: our Stuffed Aubergines (berenjenas, as we now call them, because we are, as you know, now fluent in Spanish). As usual, I don’t measure anything, and in both cases, the stuffing has depended on what we have in the fridge! 1. Allow for half an aubergine per person. In Spain, these berenjenas tend to be on the large size. Slice each aubergine in half lengthways keeping the stalk in. Aubergines start to turn brown almost as soon as you cut them open, and one way to slow this down is to sprinkle them with salt. 2. 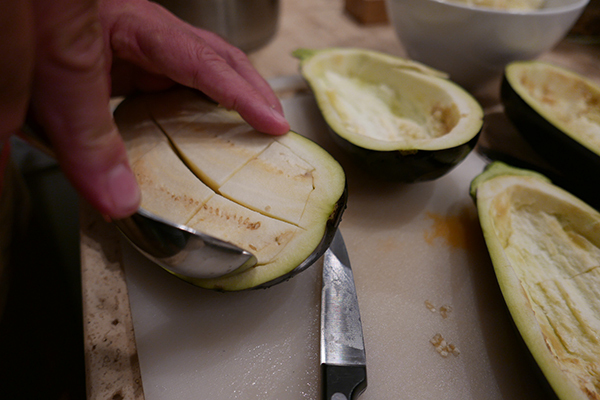 With a knife, run around the edge of each aubergine half, about half a centimetre in from the edge, then scoop out the flesh to leave an aubergine shell. Lay these in an oven proof dish and brush with olive oil. Pop these in a 180 degree oven for about 20-30 minutes to soften them. 3. In the meantime, gently fry some finely-chopped onion in some olive oil until it is soft, add 2 finely shopped cloves of garlic and some finely chopped red pepper. I also add a finely chopped and de-seeded red chilli for a bit of heat. 4. Chop up a medium-sized tomato and add that the mix, then chop up some of the aubergine flesh that you scooped out of the shells. I tend not to use all the flesh, opting for around three-quarters. Season the mix well with a liberal dose of salt and ground black pepper. 5. When the vegetables are softened, pour in a splash of white wine and an equal quantity of vegetable stock. I use stock cubes and dissolve one cube in about 100 ml of boiling water. This is just to add a bit more flavour, and you don’t want the mixture to be too wet. Simmering it in the frying pan will reduce the liquid to leave you with a rich, ratatouille-like mixture. Finally, I add some chopped black olives and some finely chopped walnuts. It is the season for nuts in Spain right now, so chestnuts, almonds and walnuts can be found everywhere. The addition of nuts provides texture and a lovely additional flavour. 6. Once the aubergines in the oven have softened, remove them and fill with the vegetable stuffing. Press the stuffing down gently as you fill the shells. Grate some cheese (manchego, of course, but any cheese will do), and lay the grated cheese on each filled shell. Place the stuffed aubergines back in the oven for a further 30 minutes, or until the cheese has started to turn golden brown. If you are not wholly vegetarian, there is no reason why you can’t mix in some jamon de serrano, or even some chorizo. Alternatively, you can serve the aubergines as a side to lamb cutlets or delicious pork fillet.